Cycling LEJOG from Lands End to John o'Groats is great fun, but a lot of preparation is needed for a successful trip - not least of which is planning the best route & arranging accommodation! There is no "official" Lands End to John o'Groats cycle route and people ride all different paths - you'll find many different suggestions online. Most people tend to stay west of the Pennines, however since I live in Yorkshire I took my ride on a more unconventional route via Leeds and along the stunning Northumberland coast (click here to download my LEJOG route). You really can go wherever you want! The best route for you will depend on many factors such as how quickly you want to complete it, how much you want to avoid busy roads, and whether there's any specific points of interest you want to include on your route. This page is here to give you tips on planning the best LEJOG or JOGLE route that works for you, as well on navigating & finding places to stay. And over on the LEJOG route planning tools page there's some step by-step guides to working with some really useful online route planning tools too. Which direction - LEJOG or JOGLE? The first - and biggest - decision to make is which direction are you going to head in?! Do you want to cycle north from Lands End to John o'Groats (LEJOG), or south from John o'Groats to Lands End (JOGLE)? The prevailing wind - Supposedly the wind in general blows south to north more than it does north to south. Based on my experiences though I'm not convinced of this!! It might influence your choice but I wouldn't rate it as important. Direction of the sun - During the summer the sun is always behind you if you're heading north; this can be useful as it means you're never having to squint to see. Availability of accommodation - Will there be a shortage of accommodation at any point? Finding available accommodation in Cornwall during the summer holidays can be especially difficult (more so than in northern Scotland), so the time at which you pass through Cornwall could be important. I'd initially planned to ride south but switched from a JOGLE ride to LEJOG after realising that I'd be finishing just as the school holidays were starting. This is less important if you can book all your accommodation in advance, or if you have a support vehicle that can drive you in an evening thus giving you much more choice. Bike shops - A less common consideration could be the availability of bike shops. There's far more in Cornwall than north of Inverness, and you're more likely to have bike issues late in your trip as your bike accumulates the miles. This certainly wouldn't be a main consideration for me, but if everything else was equal then it could be a factor. My rear brake started to wear out on the last couple of days, and without a support car to drive me back to a bike shop, I had to ride for 2 days with only one effective brake. Personal preferences - Of course one of the main factors could just be your personal preference! Maybe you've done LEJOG already and want to now attempt JOGLE, or maybe you live close to either Lands End or John o'Groats and want to finish or start near home. Some people also prefer starting at John o'Groats as psychologically (looking at a map) it feels like it's downhill! (even though Lands End is actually higher by about 150ft). Are you going for enjoyment or purely for speed? If you're happy cycling on busy A roads then your mileage might be around 900 miles; avoiding these will mean a route of around 1,000 miles (achieving this round number of miles can often be an objective in itself!). Main roads are often less hilly, faster, and better maintained than minor roads, however they're obviously not as pleasant and can often feel unsafe. Decide how many days you want to take & your rough daily mileage. With either of these decided you can calculate the other, assuming a ride length of about 900 or 1000 miles. 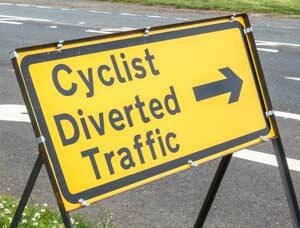 Remember to allow a non-cycling day either side for travelling to the start & end points too. What type of accommodation do you prefer? Bed & Breakfasts, hotels, youth hostels, or camping? Camping can give you more flexibility as you can pitch up anywhere (land rights depending of course! ), however it means carrying extra gear. Youth hostels are the least common, whilst bed & breakfasts and hotels can be found anywhere. These all may need to be booked in advance - see the LEJOG accomodation section below for tips. Are you just doing Lands End to John o'Groats or making it a true End-to-End bike ride? Whilst Lands End and John o'Groats are famous iconic locations they're not - despite what many people believe - the most southerly and northerly points of mainland Britain (although Lands End is the most south-western point). Those honours go to Lizard Point in Cornwall (about 35 miles from Lands End) and Dunnet Head in Scotland (about 14 miles from John o'Groats). Some people choose to add these points onto their ride. Decide on a handful of key waypoints. This will give you a very rough route, for example going via Bristol, Hereford, Runcorn, Penrith, and Inverness. You might also want to add in certain other places of interest too such as your home town or tourist attractions like the Angel Of The North in Gateshead. You also need to decide on your broad route through Scotland too. There's two main routes that people generally take to get to Inverness - via Edinburgh and Aviemore in the Cairngorms, or past Glasgow to Fort William and along Loch Ness. Plot a rough route in Google Maps. 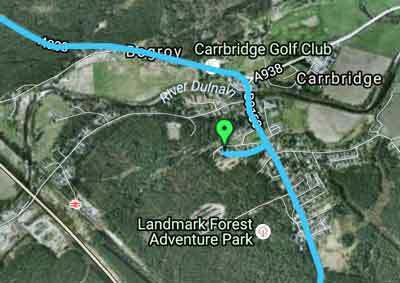 Using the "cycle route" option in Google Maps (ideally sign in first, you'll then be able to save this route) you'll be able to plot an initial route between Lands End and John o'Groats that takes these waypoints in. Study the suggested route and make any changes needed (click and drag the route to change it) to avoid any areas you don't want to pass via, for example if it's taking you through a particularly hilly region or on roads you'd rather avoid. Identify your daily waypoints. Now looking at this rough route, and knowing how far you want to cycle each day, identify towns or areas that are likely to have accommodation in roughly the right area for each evening. These locations now become your daily itinerary. Plot the detailed daily routes. Now it's time for the detailed work! There are several tools available for doing this; my tool of choice was Strava.com (see below) although you might however simply prefer to use paper maps. Either way, this is the stage where you plan the exact roads you'll be cycling on each day. When doing your planning you might find it useful to look at the National Cycle Network; a series of 14,000 miles of quiet roads and traffic free paths throughout the country that have been developed by the national cycle charity Sustrans. They're well signposted along the route which can help with your navigation efforts. You can buy the poster route maps from the Sustrans website. The Safety & Security page of this website is also worth checking out, as it contains details of routes (and how busy the roads are) around some of the key sections of the ride. Planning a Lands End to John o'Groats cycle route can be an iterative effort. When you get down to the detail you might find some areas unsuitable for cycling - for example if it's too hilly, the roads aren't suitable, or there's a lack of suitable accommodation choices - and you might find yourself returning to the overall rough route a few times to make some adjustments. Eventually though it'll all come together and you'll have your perfect route. Don't underestimate the effort & time needed for route planning! The main tool I used was Strava.com. This website has long been popular with athletes wanting to share records of their activity with friends, however the site has recently added in a route planning feature too. It is in Beta mode (at the time of writing this) and seemed to be a little buggy at times, but on the whole it worked well. It's similar to Google Maps in that it automagically generates a route between two points, but with the added option of finding the route with the least climbing. You can also choose the base map to use, overlay heatmaps of where others have cycled (to give you ideas), and even view an elevation profile to see where the hills are. And after all that you can export the routes to GPS devices as well! (see "Navigation" below). Sometimes I'd compare Strava's route suggestion with the cycle routing option on Google Maps (which has improved dramatically in recent years). On the odd occasion Google did suggest a better route which I then used, but 9 times out of 10 Strava's suggestion was just as good or better. See a step-by-step guide here for using Strava. The routes generated by Strava weren't always perfect; the tool is only as good as the data and maps it uses. On my third day the route went on dirt tracks that had appeared as roads on the map but which were impassable. After that experience I started using Google Maps to always check the aerial view of the route (you can do this in Strava too but it felt much slower than Google), allowing me to confirm that a road was, indeed, a road. The best way I found to do this was to export the route from Strava and import it into Google's "MyMaps" (see step-by-step guide here). The route was then overlaid on an aerial photo which I could zoom into to check for any potential issues. With Google Maps you can also easily share your routes as well, for example to let your loved ones know exactly where you're going. Even Google Maps wasn't always enough. There are some areas, particularly in Scotland, where the resolution of aerial photos (both on Google & Bing Maps) isn't very good and are nothing more than a colourful blur when zoomed in. This is where Google Street View was particularly useful, helping to see how busy certain roads were as well whether a cycle path really did exist next to a busy road. It can also be extremely useful for verifying if a road is passable at all and not a gated private road - if the Street View car has been able to drive the road then it's a fair bet that you can ride it too! 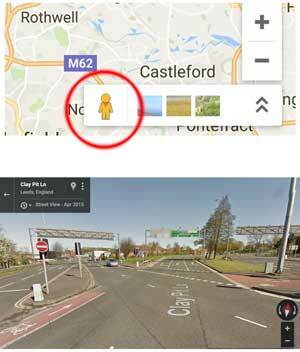 To check which roads Street View images exist for (or more interestingly, which ones they don't) then simply drag the orange man icon (on the bottom right of the screen in Google) over the map and all roads with Street View images will turn blue (dropping the man onto a road will then launch Street View for that road). If a road you're interested in doesn't turn blue then you'll need to investigate further, or find an alternative route. I didn't use Street View for the whole route (that would have taken hundreds of hours! ), but it was especially useful for just quickly checking out any spots that I wasn't sure about. Another great website that's been around for years - which I only discovered after having completed LEJoG - is Cycle.travel. This website is purpose built for planning cycle routes around the UK. It works like all other mapping software - you enter start and end points and it plots a route - but it's built for cyclists. It knows about all the National Cycle Network routes, has a full list of campsites, and even has several classic routes (such as Coast-to-Coast) already in its database. I used this site extensively whilst planning my European ride in 2018. It works well, although will sometimes take you on dirt tracks even if a well surfaced road is nearby (and it has no option to avoid dirt tracks either). Once you've created your route you can download it in a variety of formats suitable for your GPS unit. One final website is www.ridewithgps.com. This is great for route planning as, unlike Strava, it has the key feature of allowing you to edit pre-existing routes (such as the one I make available here). It does cost but only $6 a month and you can cancel anytime. Its route planning features are superb and allows you to merge or split sections, with routes snapping to follow the road network as you move waypoints too (unlike some free alternatives such as ViewRanger). If you have any other favourite tools you use, perhaps with the power of RideWithGPS.com but for free, then please let us know using the comments section at the bottom of this page! Finding accommodation en-route can be a pain! If you're certain of where you'll be each day (if you're confident in your fitness levels) then it's probably best to book it all in advance. For me though, not having done any long distance cycling before, I was less confident of my fitness and so wanted to stay flexible. I booked the first week's worth of accommodation in Cornwall, where choice is more sparse and where I didn't think I'd be able to rely on finding anything day-by-day. I started with a very low daily mileage (around 30 miles - I knew Cornwall is hilly! ), figuring that after Bridgwater I'd know by then if I could manage a larger daily mileage and that there'd be more choice beyond that point. Between Bridgwater and Inverness I then booked accommodation a maximum of 2 days ahead as I went. Staying flexible paid off, as I was unexpectedly forced to have 2 rest days in Cheltenham whilst my broken rear wheel was rebuilt. If you do book ahead always check the cancellation policies! Booking ahead does obviously have advantages though; there'll be more choice available and it will often be cheaper. From Inverness to John o'Groats I again booked in advance (once I was north of Edinburgh) due to the lack of accommodation there. Even booking a few days in advance I still had to spread my route out over 4 days instead of my preferred 3 due to the places I wanted being fully booked. Direct bookings were also often (although not always) cheaper. In addition the Cyclists Welcome website is another extremely useful place you should try; this CTC-run site contains searchable listings of cycle-friendly accommodation throughout the UK. Another popular choice amongst long distance cyclists is Warm Showers. This is a community of cyclists who open their homes to fellow cyclists, with the intention being that you reciprocate and offer accomodation to other cyclists. And finally there's the Beds For Cyclists website as well - they even have a page dedicated to accommodation listings for LEJOG'ers! Premier Inn hotels are especially good at accepting bikes. If they don't have a store room then you can often take it up to your room (nb Premier Inn aren't on Booking.com, you'll need to go to their website directly). It's always best to phone ahead to double check about your bike. Youth Hostels are also good for bike storage, although their accommodation is more basic than B&B's for often not much difference in cost. Always think about where you'll get an evening meal from! Before booking somewhere check if there's a pub or restaurant within walking distance. Some B&B's will cook evening meals by prior arrangement. Not all B&B's are registered on Booking.com. Sometimes by zooming in on Google Maps you might find some other ones listed in locations that you're interested in, which you can then look up on Google and contact direct (what would we ever do without Google?!). Also consider contacting local tourist information offices for help too. Road sign on route in Northumberland! No longer do we need to carry numerous heavy & bulky maps, constantly trying to work out where we are and having to keep re-folding and re-orienting the map as we tick off the miles - modern GPS units will do all this for us in one small lightweight package. Genius. They may cost but in my opinion my GPS unit was one of the best pieces of kit I took with me; it enabled me to just concentrate on the cycling and enjoying the scenery without having to stress about finding my way. There's many different models available; the one I used was the Garmin Edge 1000. This is an extremely popular GPS unit which mounts easily onto your handlebars and gives you turn-by-turn directions as you go. It can record various aspects of your ride too such as your speed, your actual route taken with any diversions, the altitude climbed, and even the outside temperature. You can then upload all of this data to the web to share with friends and family. Getting your routes onto the device is a doddle. You simply export them as .gpx files from Strava (or whichever website you used to create them in) with a couple of mouse clicks, connect your Garmin to your PC via a USB cable, and put the route files into a folder ("New Files") on the GPS unit. Easy! 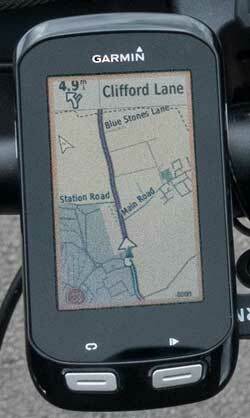 See our step by step guide to uploading route files onto Garmin GPS units. Sometimes it was too easy to take the Edge for granted so it's always a good idea to have backup plans! One night I forgot to re-charge it so was extremely thankful that I'd packed a tiny portable battery pack that I could use to keep it powered through the next day (this was also useful for recharging my phone as well). The inbuilt maps on the Edge also aren't the best if you find yourself having to re-route for whatever reason (zooming out and manually scrolling are slow and awkward), so another tool I used a couple of times was an app on my iPhone called "UK Map". 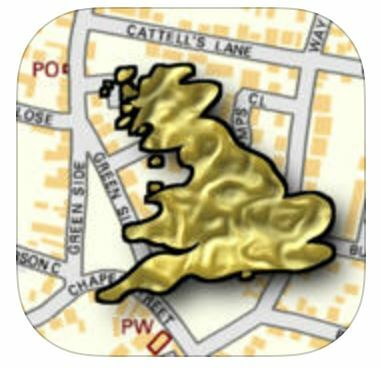 This costs £7.99 to download but you can then download detailed maps from along your route (from the Open Street Map project) for free. The maps are stored locally on your phone so you don't need a phone signal to then use them - handy when you're in the middle of nowhere and can't access Google Maps! With this app it's like having an Ordnance Survey map of the country in your hand, allowing you to find out where you are (using your phone's GPS) and to quickly see how to get back on track. I found it extremely useful & highly recommend it! Other similar apps, including ones for Android phones, are also available, including MapOut which is built for cyclists and shows where all the cycle routes are. Everyone's routes will be different as we all have different goals and priorities, however ready-made route files can help to get you started. You'll still need to do some work though, especially as you'll need to deviate slightly to get to wherever your accommodation is. First up are the route files I made & used. The majority of my riding was on quiet roads and separate cycle paths, although there were necessarily a few main roads along the way too (nothing that I found uncomfortably busy). I've made some slight adjustments since riding it (less than 20 miles total) where I found certain stretches weren't accessible or realised it could be improved. Overall I think this LEJOG route is as good as any you'll find anywhere else! Visit our dedicated page to download a zip file of these readymade LEJOG routes (in GPX format and ready for use). Cycling UK (formerly the Cycle Touring Club - CTC) also produce a pack with 4 suggested routes including both fast and quiet scenic routes, as well as an off-road route for a tougher challenge. Details of how to get this pack can be found on their website; currently it's free to Cycling UK members and £12.50 to non-members. The other option you have is to buy a book put together by Royston Wood which details a "safe route". Royston has ridden LEJOG (and JOGLE) three times now, and his experiences have prompted him to find a route that's entirely on quiet roads and paths. This can be bought from Amazon here*. How did you go about planning your route? Have you got any tips to pass on to others? Let us know here!